Thyristor or Silicon Controlled Rectifier is well known as SCR. This device have four layers, three junctions and three terminals. 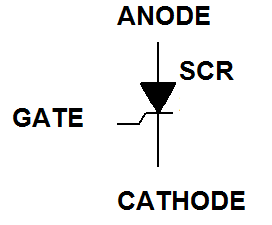 Three terminals of SCR are gate, anode and cathode. Gate is located close to cathode. Like in PN junction diode, anode and cathode terminal makes thyristor or “silicon controlled rectifier” a RECTIFIER. Gate terminal controls the current flow from anode to cathode hence the name Silicon controlled rectifier. Anode is always connected to positive potential and cathode to negative potential. so current always flow from anode to cathode. 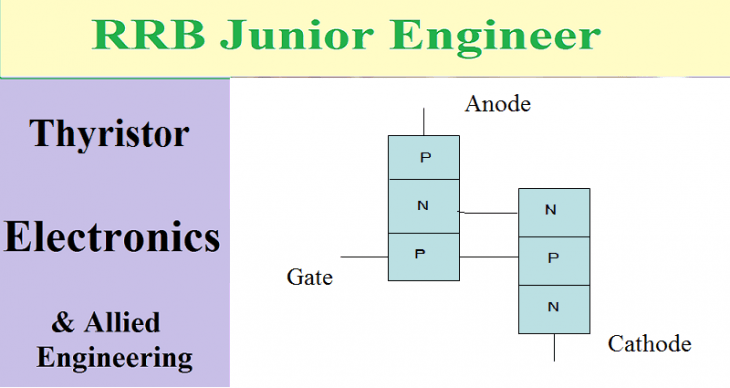 In that case junction 1 and 3 will be forward biased and junction to is reverse biased (go through PN junction diode portion for more explanation of this biasing). 1 Why Thyristor is not germanium controlled rectifier ? Why Thyristor is not germanium controlled rectifier ? Thyristor or SCR is basically a switch. During off time of the switch there should not be any current. But leakage current of germanium is comparatively higher than silicon . It is due to increased band gap (1.12 V) of silicon than germanium (0.7 V). It can be used to control the usage of electricity. For an example, it is used in new generation fan regulator (a small switch like regulator). In old regulators, we are controlling the current flow to adjust the speed, for that resistance of main current is changed, so in some situation current have to pass through large resistors. Which will cause enormous power loss (consider fans in a large auditorium). By the introduction of SCR in regulator, we can control the speed of the fan with small amount energy loss. 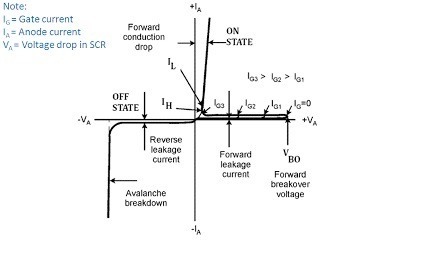 As shown in the figure an SCR is a combination of two transistors. According to the supply voltage current will flow from anode to cathode. because anode is connected to positive terminal and cathode to negative. This current is controlled by gate terminal. 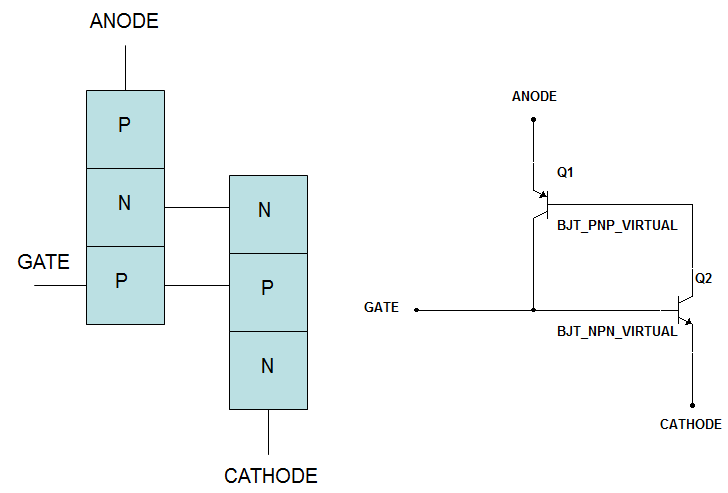 This gate is connected to low positive potential and the low negative is connected to cathode. If the supply to gate is zero then there will not be any control. 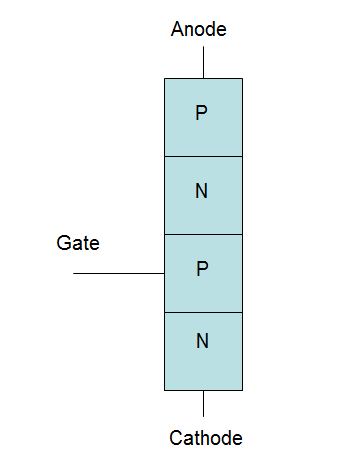 If their is some potential in gate then gate control the current flow. If the supply voltage to anode is increasing and gate is kept zero. then anode to cathode current increase. like in PN junction diode. zenor breakdown occurs. here also a breakdown will take place and corresponding voltage to anode is called forward break over voltage. Basically SCR have two states. they are Turn ON and Turn OFF states. Their is no other states in between. So SCR is purely a switch. There are two ways to turn on SCR. In first case make the gate terminal open and increase the anode voltage till the break down voltage. In second case (commonly used). connect a small positive potential to gate and increase the Anode voltage. There are two ways to turn off an SCR. In first case decrease the supply voltage (anode voltage)and make anode current below a limiting value called holding current. In second case increase the resistance of the circuit to decrease the anode current below holding current. It is the minimum forward voltage (when gate is being open) at which SCR starts conducting heavily. That is Turn On state. It is the maximum reverse voltage at which no reverse current. It is the maximum anode current (gate is being opened) at which SCR become Turn OFF state from conduction state. It is the maximum possible anode current, which SCR conducts with out destruction. The usual rating of SCR is 30A – 100A. It is the product of square of the surge current and duration of surge current. Instead of using small positive potential at gate terminal light. So here light is controlling the passage of anode current. Hence it got the name light activated SCR. We prepared this list from the suggestions of Junior Engineers who got selection in 2014.